I feel like I should say something today. This is a public rhetoric class after all, and there is no more pressing a public issue in our community today than the recent Grand Jury decision and our subsequent responses, which continue even now. A public occasion such as this would seem to demand that we each have something to say. That this is a class in public rhetoric suggests that I should have something to teach you about what to say. But that’s alright. More than alright, it is entirely appropriate and just. Public rhetoric is as much about listening as it is talking. I have taught you to talk and write with empathy: to know your audience, to sympathize with your audience, to respect your audience. What I have not taught you is how to hear and read and watch with empathy: in short, how to be an audience of and for the public rhetoric of others. In the absence of much to say, there is much to listen to. Protestors in St. Louis. 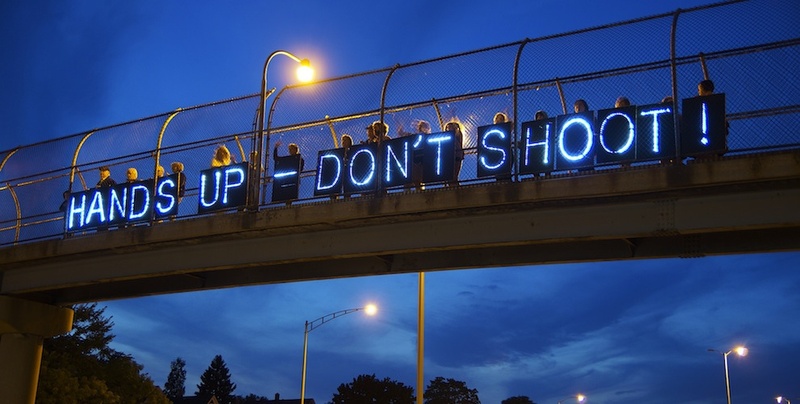 "Hands Up - Don't Shoot!" is a common refrain. But just as it matters how we talk, it matters how we listen. Listen not to form a lasting opinion. Listen not to sort allies and enemies. Listen not to arrive at a final judgement. Listen. Hear so that you might come to know other people: their position, their pain, their propositions. Take people at their word, their words, which are so very important. Do not rush to ascribe motives, which are deeply complex and often unknowable. Do not be secure in your understanding of someone else’s position or pain. Do not draw parallels between their life and yours. Allow others to exist on their own, irreducible to you. Just listen to them tell you about their life. This is hard of course. Damn hard. I am often not strong enough to listen. I want to quickly make sense of things so that I might know where I stand. But in my rush to make sense of things, I shut myself off to what else there might be. And that is a troubling rhetoric. If I could ask anything of you now, as your teacher, I would ask that you take the upcoming break to listen and to hear. That’s all.